The MA 4x DP-k modular connector unit serves to connect Leuze Ident systems (IDS) as BCL 8, BCL 22, BCL 32 and BCL 80, RFM 12, RFM 32, RFM 62, VR and hand-held scanners directly to the PROFIBUS DP. This is accomplished by transmitting the data from the IDS via a RS 232 (V.24) interface to the MA 4x DP-k where a module converts it into the PROFIBUS DP format. 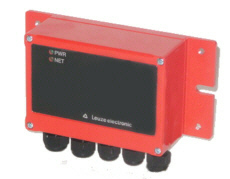 The data format of the RS 232 interface corresponds to the standard Leuze data format. Purchase your Leuze MA 40-41-42 DP-k MA 41 DP-k HS Modular Connector Units today!